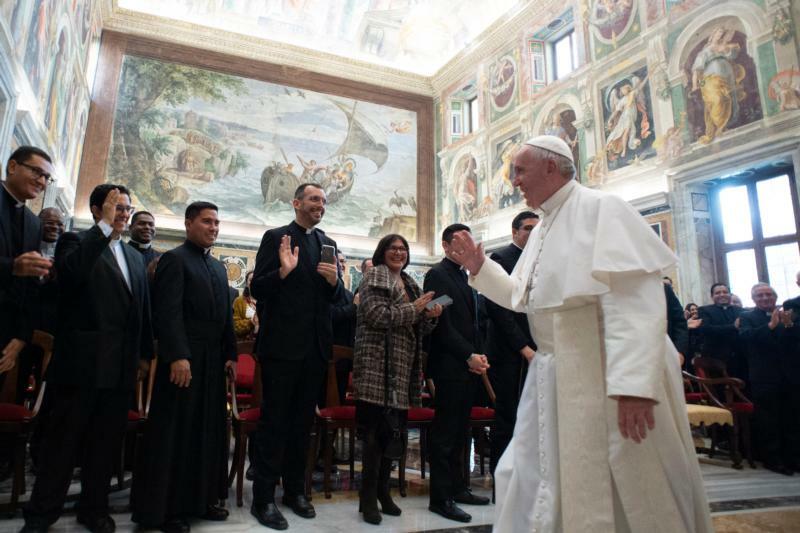 VATICAN CITY (CNS) — Christians in Latin America must hold fast to their traditions, which are rooted in love for Christ and especially in remaining close to the marginalized and downtrodden, Pope Francis said. “Our continent has succeeded in giving shape to a reality in its tradition and in its memory: the love for Christ and of Christ can only manifest itself in passion for the life and destiny of our peoples and in special solidarity with the poorest, the most suffering and needy,” the pope said Nov. 15 to students and faculty of Rome’s Pontifical Latin American College. “A priest in his parish, in his diocese, can do a lot — and that is good — but he also runs the risk of burning himself out, of isolating himself or harvesting only for himself,” the pope said. “So, little by little — and almost without realizing it — we will end up offering Latin America a God without a church, a church without Christ, a Christ without a people or, if we want to put it another way, a God without Christ, a Christ without a church, a church without a people, (which is) pure reworked Gnosticism,” the pope said. “Let’s not forget her and let us confidently ask her to show us the way, to free us from the perversion of clericalism, to make us more and more ‘shepherds of the people’ every day and not to allow us to become ‘clerics of the state,'” he said.